It’s Monday morning and we’re the winners of the National Football League for 2019. 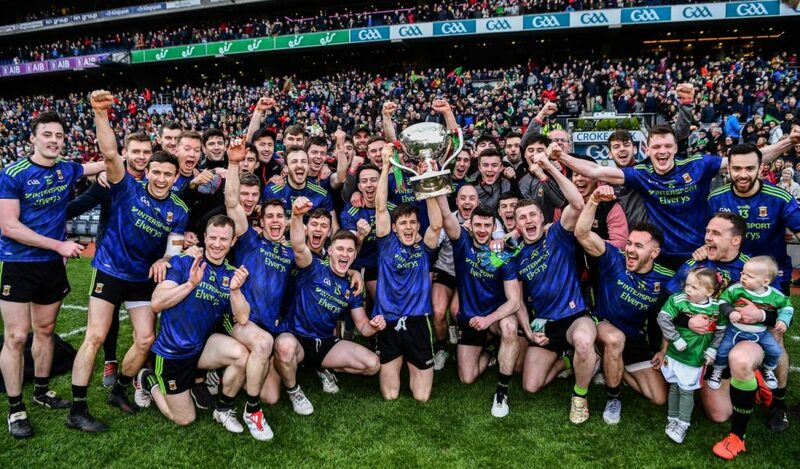 Here’s what’s online about yesterday’s memorable title-winning performance at Croke Park. Nationals: Irish Times – match report, Keith Duggan piece, post-match quotes; Irish Examiner – web, print; Irish Independent – match report, post-match quotes, Billy Keane piece, Eamonn Sweeney piece; Irish Mirror – match report, post-match quotes; Irish Sun, Irish News. Others: GAA – As It Happened (includes video clips), match report, post-match quotes (James Horan, Diarmuid O’Connor), Team of the Week (we’ve five players on it); RTÉ – match report, post-match quotes (James Horan, Diarmuid O’Connor, Andy Moran, Peter Keane), Colm Cooper analysis, Kevin McStay analysis, Aidan O’Rourke column; Sky Sports; BBC; The 42 – match report, As It Happened; Pundit Arena; Breaking News, Sports News Ireland. In case you haven’t got to it yet, my own post-match audio ravings are here. That’ll have to do you for now, not least given the fact that I need to pen 600 words for the Mayo News and the clock is ticking rapidly on that. But, of course, there’s much more to come today. Rob is editing away on this week’s feature-length edition of the Mayo News football podcast, which should be online around lunchtime, and I’ll post the results of the MOTM poll later on too. You’d never know – I might have other stuff as well before the day is out, if time permits. Have a great Monday. Up Mayo. Fair play to ya Willie Joe, been waiting all morning for this post. A great service you provide, going to enjoy the cup of tea reading these :). One of my favourite things yesterday was walking back to Heuston station after the game, big full sun in the West warming my face. A really content feeling. So many times I’ve walked that path in despair. Yesterday’s win has made the incoming commercial directors job a little bit easier, it’ll sell out the New York function alone and be a big boost to the fundraising campaign in general. Keegan can add O’Shea’s scalp to the collection and by Christ those A v B games are going to be ferocious encounters, with 5 championship starting positions up for grabs in my estimates. Just making the 26 will be an achievement. It’s a nice problem to have but really wondering what the Champ HF & FF lines will be. – Fergal Boland has had 2 really great games. 5 points from play. Very hard to drop. Could he play CHF? – Fionn McD – great league. Scoring steadily. Incredible engine. – Jason Doc – usually an automatic starter but who gives way in HF line? Could play CF of course. Coen – not scoring massively but great link play. Offers something we did not have previously. Cillian – Usually nailed on starter but…. Andy, Carr, Reape, Treacy, Diskin, Regan – Some great options there. Waking up this morning without that crushing feeling of another final loss was bliss..
Mayo 5/1 at half time with Quinn Direct. Withdrew my $$$$ straight away before another Quinn Collapse. Great to have choices, couldn’t find a scoring forward to save our lives but now there coming off the conveyor belt. Pity Cillian couldn’t have gotten some playing time would have liked to have seen him at CHF. Young Carr you’re not a secret any more. The kick passing yesturday was a joy to watch in the last two games I don’t think I have ever seen Aido foot pass more, and of the higest quality. Two passes to Darren Coen comes to mind. Matthew Ruane is looking like a man posessed what an engine. Boland tracking back and tackling is a massive plus and goes unnoticed. Having played halfback in his Sigerson says he definitely knows how to defend and makes him an ideal RHF for JH. Don’t think he will lose his spot after his last two displays. Darren Coen his instinctivness and vision is very good just needs to settle down on his shooting. Andy’s wise head at the end showed another player would have taken those shots on. Its great to have some new options, been able to bring in A Moran 15 minutes to go is some asset, Horan seems to be able to find and get the best out of old and new players. Physicality is back and some of the quick movement is also evident which I knew Horan would bring. Only concern is guys been isolated at the backs, we got caught twice yesterday but were solid in second half, but against Dublin you could concede a lot of goals, and this was an issue last time inder Horan, but I guess we cant have it everyway, but its looking bright for the summer. Lovely pep in the step this morning! I was genuinely very emotional when the green and red blared out, as Andy said on Newstalk, you don’t really know what it means until it happens. Well now we know and I’m greedy for more. I watched the game back last night and we really should have been out of sight, our 2nd half showing was magical in all aspects other than the scoreboard. We left 5 scores and two goal opportunities behind us, and James Carr should have had a penalty. Getting over the line in spite of all this, with Treacy’s superb finish at the end, I hope will prove to be a cultural pivot for this team that we can look back on and say “that’s when it changed”. These players are such a privilege to watch, relentless & breathless and utterly bloody minded, they owe us nothing, they are the gift that keeps on giving, we’re blessed to be living through this wild ride. Onward! Up Mayo! It’s in the works, Remember51! IT Department are on the case. Clarke, Hennelly, Schlingermann (if a 3rd keeper is to be kept – I’d suggest it’s a worthy investment for the future given Clarkes age). If there is to be a development/Extended panel, then James McCormack, Conor Diskin, Colm Moran, Cian Hanley and Oisin Mcloughlin. Ideal scenario would be for us to operate with as large a panel as possible, but Financial constraints and logistics no doubt prevent that from being possible. Getting used to that strange winning feeling today! What a team! What men! The biggest impression I got from yesterday was the total lack of any panic on the part of the players at any point in the game. Horan must be a Zen master or some kind of reincarnated Shaolin monk from up in the Himalayas! His demeanor never changed on the sideline as he has total belief in his players and knows better than any of us what they are capable of. Hard to pick out players as all delivered. AOS was immense again and his foot passing is sublime. Kerry wanted him off the pitch and went about in in their usual underhand way. First yellow was a joke and you can be sure it will be tried again in the championship. DOC/Ruane outstanding. Barrett gave no change to a man who looked about a foot taller than him! I could go on and on as all are heroes. Fifty plus years following Mayo and TG I was there yesterday to witness it. Can’t wait for summer! Thanks Willie Joe for all you do to keep us on the right path. Thoroughly enjoyed Keith Duggan’s piece – as always considered and thoughtful. It’s just lovely to be basking in the relief of a win and enjoying it for what it is. I don’t think anyone will ascribe it any more significance than it deserves, but equally it deserves to be celebrated and cherished because it is a commendable achievement. Living for the Mayo News podcast later. No pressure! A great feeling this morning surely. Watched MayoMicks epic video of end of game and celebrations: there is something in my eye after that. Cutting the panel this year will be tough I think we carried 34 last year to account for injuries. I see no Brian Reape, Evan Regan, James Durcan Jason Gibbons, Conor o Shea on your list don’t think all will be dropped. No development places for Cathal Horan and James Kelly, these might be worth holding on to. Things are starting to look a lot brighter we now have Boland McDonagh Treacy J.Durcan, R o Donoghue and Hanley for half forward and Carr Diskin Reape for inside forwards. I do think Carr can play anywhere he is that type of player, such wheels for a big man. Diskin is no slouch either. Next year I expect Tommy Conroy The Neale to join the list and what about Liam Irwin will he finally settle down and show the talent that others only wished they had. Next year if maybe the backs that will be looked at but that’s for another year. you’re right Mayomessi and I left those out as I felt the rest might have more to offer, though James Kelly might be the one i’d waver on for a development spot. if we go with 34, then I’d add James Durcan and Brian Reape back into the squad. The latter along with Liam Irwin are 2 players that have buckets of potential but for various reasons haven’t come through on that, though maybe the reasons that the same two have not featured at senior level are much the same. Also the Neale’s Tommy Goals is one for the future alright, I’ve often wondered what happened the Kiltane lad of the same name – i know he had a fairly horrific time of it with injury and whatnot for a while, I don’t know if he’s ever got back to his old self after that. James Carr certainly looks the business alright – for a lad who got his first start in a national final he certainly did not look out of place. Great win yesterday, fantastic to see the Crest on the big screen at full time, and the Green & Red blasting through the speakers. An observation on the targeting of AOS, I think we may need to get into the press quickly this week to sow the seeds in the refs minds ahead of the summer. Teams are obviously going to target him, and it was a completely undeserved first yellow, but if it gets lost in the win without being called out, then we’re gonna have a repeat this summer that could be very expensive, it’s the one area of the pitch we don’t have any depth in at the moment. Neither the ref or the linesman had any idea what happened, so they had no business booking him. The Kerry lad was dragging out of him, and finished on top of him on the ground, in all the pulling Aidan did absolutely nothing wrong, except be on the ground when the ref finally came over. We should be out in all the papers and radio shows calling this out now that we’ve won. Put it in the officials heads that you can’t just book both players if you don’t know what’s happened. We should be everywhere about it, call it out now. It was great to get the win. It was a game that we could have won by 10 points but if Clifford’s attempt had hit the net we were under pressure. We will bounce into the Connacht championship now where a bigger challenge lies in my opinion. We have unearthed some great options and some of the elder statesmen look rejuvenated by the injection of youth. For the first time in quite some time we have massive competition for places.. I hope the lads celebrated the win. You have to celebrate on days like these..
Tommy Conroy Kiltane was on the Panel during the FBD league and made the first couple of match day panels but didnt come on. It was interesting to me that our young lads seem a lot more physically developed than theirs. Our kick passing tactic seems to be working well, we are executing it to a very high level. Thought the ref was quiet poor, inconsistency is what kills me with them. Aido gets a second yellow for a push, silly thing to do, yet Diarmuid gets f@cked over the line with a push in the back and its not even a free. He also seemed to change his mind on how he was reffing certain things several times in the game. I think if we got a penalty it would have been soft enough so no major compaints with that. There are no guarantees Kerry will make it, I know they have a massive pool of talented players to choose from but it might take some time for them to get their and the patience might run out which would mean a new manager and then you start all over again. I predict the Kerry fan patience will run until the end of next season and the minimum that will sate them is an all ireland final appearance. The big difference between senior and underage is the physicality, it can take 3 to 4 years of solid involvement in inter county S&C to get to the right level, and if its not done right then injuries take their toll. Some bodies cant take it, some bodies lose the step or the speed that they had at underage because of it. I think both managers desired alot of credit yesturday, We all know the amount of players JH used and the amount of new players brought in. Peter Keane also introduced alot of youngsters, starting a 19 year old in the middle of the field some might say abit to early but I applaud him for having the balls to do it when so many others won’t. Kerry U20’s will be severely depleted if they have to do without Clifford and Diarmuid o Connor. Also a shout out to Donie Buckley, he left his mark all over the field yesterday and on watching back showed his class at the end congratulating the mayo players. And as for the steward that didn’t let Tom Parsons onto the field he desired a good swift kick in the bollox’s. And Finally don’t ya love them blue Jerseys. Good observations there, ECE. The thing is, Kerry put almost senior like structures in place at minor level to bridge the gap to Dublin. It earned them a phenomenal 5 minor titles in a row. Yet, of the successful 2014 panel, only 8 are playing sports of any kind. South Kerry was a traditional stronghold, however, with depopulation, their contribution is now relatively small. Killarney and north Kerry areas, now seem to be where the players are sourced. IMO too much emphasis is put on these academies, and expectations go through the roof. Regardless, traditionally, counties will have a given level of talent to choose from. These expectations of avalanches of talent are pie in the sky..
I’m so happy for the team and for the county as a whole. Its very satisfying so congrats to all. Winning this was important in more ways that one. First, obviously winning a final in Croke Park is huge, something we haven’t managed to achieve recently, so that monkey is off our back. Second, winning against a top team like Kerry, for were not just playing against that team, we’re playing and winning against all the winning tradition that comes with the Kerry brand. Make no mistake, Kerry are pissed they lost to Mayo. And third, winning a close game, pulling through when the pressure was on, this was big and will stand well to these fellas come the championship and the pressure in Croke Park. Btw, was listening to Wooly’s podcast. Its a bit rich for them to be complaining about paddy durcan and Leeroy, while ignoring the way Aido picked up his first yellow card, a card that could have been decisive. Quick note to point out that Tom Parsons was allowed on the pitch. Yes there appeared to be some confusion with the steward that was broadcast on the TV and big screen, but it then cut away. A few minutes later, from my position in the Hogan, I could clearly see Tom on the pitch in front of the presentation area mingling with the extended panel and backroom team. So while he was stopped initially by the steward, it was all resolved quickly enough, just the cameras didn’t catch it. That’s an important point to make, HaunisExile, and it’s clear that nobody associated with Mayo GAA wanted to make any issue about it at all. The steward was only doing his job and it’s perfectly possible he didn’t know who Tom was. If it weren’t for that clown Des Cahill the story wouldn’t have got legs at all. Horan’s comments about should have won by 10 points didn’t go down well with some Kerry folk.They also acknowledged that their S&C was well behind ours and I think that was very evident especially in the second half when we upped the intensity .I know it was a league but still psychologically for the lads I think it will change the mindset . Ah Willie Joe, Des is one of the most genuine broadcasters in GAA. The whole thing was broadcast live by the TV cameras WJ, it would have been picked up with or without Dessie’s online outpourings. Fair play Mayomessi – while it’s a shame Tommy C hasn’t nailed down a place its good to see that he’s getting a look in. – The “Blue Lions” tore into that second half after a nervy first half and really for all the possession we had we were worth more than the 4 points winning margin at the end. – BUT these players, James Horan and we the fans know this is but a small step there is one and only cup that matters. – Thanks to Gamechanger, Martin The Dub Lorreto Road and Outta the blue for your good wishes. – Enjoy it lads you deserved it, a win is a win. The national media and everyone else seen yesterday how much football means to Mayo people. Agree with you there Mayomessi – Donie Buckley is a class act. His fingerprints were all over Croke Park yesterday, with both teams giving exemplary tackling displays. And, to see Aido embracing him afterwards was a special moment. Ppl should get over the Tom Parsons thing, it’s a nothing burger! I debated long and hard about whether to travel back for it. So glad I did. Had a lovely couple of pints in Gills after the game with the old man. Will always remember that. Rock..Your early start to the day was worth it!! Horan’s ’10 points’ comment wasn’t meant for the suddenly sensitive ears of Kerry folk (God love them). It was meant for Mayo’s forward division, and I for one was delighted to hear it. Now that a Croke Park final has been won, we need to make sure that the next time we’re in a winning position in a final, our shooting is sharper and much more composed. Aidan O’Rourke’s piece on the RTE website is well worth reading in that regard: bad shot selection at the end almost cost us a great victory. JH is immediately raising the bar for his forwards. That’s the way to go. agree with you there DavyJ. To be fair to Kerry fans if the same was said in a reverse scenario we may react similarly. It is true however that we should have scored more than we did. I wouldn’t have classed Fergal Boland’s fisted effort over the bar in the first half as a goal chance as the angle was very tight – similarly Ruane’s point in the first half, though that had more of a goal chance to it. Jason dropping a 20 yard free into the keeprers hands, Vaughan’s goal effort in the first, Jame’s Carr’s in the second (Coen got a point from it) and a few wides here and there all add up. Robbie scored none of his efforts, bear in mind, all of these would have made up the 10 or 12 point difference referred to. Coen had a few wides during the game and towards the end there was a bit of wayward shooting – i think Fergal Boland had a wide in the last 5 or 10, and I can’t recall who put the last one wide before the whistle. It’s academic now but there were a lot of opportunities that we didn’t convert, and that’s something that can be worked on. Its good to get the win, better to get the win and have room for improvement and knowing what it is we can work on.